Posted in Health & Wellness on January 26, 2009 by FloridaHealth.com staff. Last modified on December 02, 2018. Read disclaimer. One diaper manufacturer has estimated that the average child goes through 6,000 diaper changes before finally graduating to training pants. For many parents, that's about 5,000 diapers too many. But the transition from full service to self service can be horribly frustrating for everyone involved. Sadly, toileting problems are the second most common provocation of fatal child abuse in this country. One thing that many experts agree on is that starting as soon as the child and parent are willing and able to participate (usually between 18-26 mo) is better; The training period could take a bit longer but may minimize later problems with incontinence, bed wetting and urinary tract infections. There are even some new strategies to help parents get through this difficult period with their youngsters. The following are toilet training tips and ideas to consider. Toilet "learning" versus toilet "training"
Many parents equate potty training to housebreaking a puppy, and anticipate many trials and errors before finally achieving success. It doesn't help to verbally tap a kid on the nose with a newspaper, though; a whole series of events have to take place before your youngster is ready -- physically and emotionally -- and nothing can hasten that day along! Experts point out that toilet training is something you do to your child. Toilet learning, on the other hand, is something you do with your child, by helping him learn to recognize and master a very important developmental skill for a lifetime. Some parents rush into the potty training arena and are then upset and worried because things don't go as planned. This should be done at the right time, for the right reasons. Many parents try to expedite the process because many daycare centers won't accept -- or charge more for -- children in diapers. When this is the driving force for getting a youngster out of diapers, Mom and dad are usually doomed to failure and a lot of confused tears -- and that's just the parents' reaction. Pediatricians warn that asking a child to do something for which he is not physically or developmentally prepared can cause feelings of inadequacy if he fails to live up to a parent's expectations, and that's more stress than any toddler needs. While just a generation ago, it was "fashionable" to toilet train children by the time they were two years old, today the American Academy of Pediatricians suggests that the best strategy is not to adhere to such rigid guidelines, but to let the child lead the way. It works and it's a lot less stressful. Let's face it; toddlers are not known for being overly cooperative. In many cases, however, their minds might be willing to move on to "grown up" bathroom skills, but their bodies are not. Until about 18 months of age, a child's neuromuscular development is still too immature to master "command performance" toileting. Excretory functions up to this point are controlled by an automatic mechanism. As adults, most parents don't remember what they went through before they were safely "potty trained." If you stop to think about it, learning to use the bathroom is a complicated process. 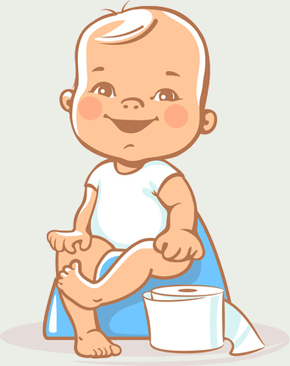 A youngster must first feel the sensation of a full bowel or bladder, understand what that feeling means, and then be able to make the connection between dry pants and using the toilet. He has to send a mental command to his sphincter muscles to "Hold," and then to physically contract them. He has to walk to the bathroom, unzip, unsnap or unbutton and pull down his pants, approach the toilet or potty, and then let it go! If a child cannot do all this, he is not potty trained; his parents are trained by being able to predict when their child is likely to relieve himself and having the potty or toilet in close proximity. While each child is different, it is probably a safe bet that by age two and a half, toilet teaching can productively begin. There will be some signals along the way: a child may wake up dry from a nap, and stay dry for longer periods of time. He may pause during playtime -- or even look surprised -- when urinating. He may complain about being wet or dirty and indicate by gestures or words that it is time to change his diaper. It is not far from this realization to understanding that he will feel better dry and clean by using the toilet instead of his diaper. For some youngsters, this discovery coupled with the encouragement to do something else just "like the grown-ups" sets them firmly on the road to making the transition. Once your child appears to be physically and emotionally ready to begin toilet teaching, be sure your toddler can: follow simple instructions; walk to the bathroom without help; pull pants down and back up without assistance; and understand what the toilet is for. Then it is your job to put the three C's into action: to be Casual, Confident and Consistent. Decide whether you will purchase a potty chair for your youngster, or if you will teach them to use the standard toilet from the start. Some argue that potty chairs have to be emptied into the toilet anyway, and foregoing the potty means avoiding another transition down the road. One of the first milestones in toilet teaching is getting your toddler to tell you when she has to go, and then successfully holding it until you can get her to the toilet. One way to start this process, is to place her bare bottomed on the seat of choice, and tell her this is where she will go "potty." Sometimes, a little suggestion helps. Run the water in the sink while she is sitting there, and perhaps she'll feel the urge to urinate, turning a practice run into a direct hit! When this happens, celebrate it like the joyous occasion it is. Praise her, hug her, encourage her. But don't set up a system of rewards for a natural process. Being dry and clean and "grown up" is reward in itself. Demonstrate how the toilet lid goes up and down and how the handles makes the water flush the contents of the bowl away. Explain from the start, however, that the toilet is not a plaything and that one of the most important bathroom "rules" is to wash your hands after going potty. Never force a child to sit on the toilet for prolonged periods of time if nothing is happening. If your child wants to get up after one minute, let her do so. And never hold or strap a child on the toilet. Try placing your child on the toilet after naptime, or about 20 minutes after a meal and say, "I bet you have to go potty now" -- or whatever the choice of words you decide upon for body parts and elimination functions. Praise all cooperation with hugs and encouragement. Once your toilet teaching is underway, it will make a big difference what your toddler wears. Forget about fancy overalls and ruffled tights during the early stages. The most important thing is for the child to be able to negotiate pulling his or her pants down and getting to the toilet in time. When you're at home, a T-shirt and training pants will be just fine. Some kids will take to the toilet at once and leave the diapers behind for good. Girls seem to learn faster than boys. But all youngsters will have accidents. They don't do it on purpose; very young children don't feel the urge to go until the very last minute…and sometimes that is just too late. Other times your youngster will sit on the toilet without results, and have an accident five minutes later. While these times may try your soul, it is important to be understanding and encourage better luck next time. It is more difficult to maintain bladder control at night, so most children achieve daytime dryness long before they are able to wake up dry. Nearly 25 percent of all five year-olds still wet their beds. This is perfectly normal. Even after you thought the process was completed, youngsters may sometimes regress and go back to having accidents -- during the night or daytime. While each child is different, daytime control is usually achieved by age three-and-a-half to four years and bed-wetting stops by age six. If your child hasn't learned the appropriate bathroom skills beyond these ages, consult your pediatrician as there are sometimes physical causes for delayed control.